If you play pickleball you probably already know that the game was invented by combining elements of three sports: ping pong (table tennis), badminton and tennis. The unique blend of sports makes pickleball the entertaining and challenging sport that it is today. However, the mix of sports and the unique terms used in pickleball can cause quite a bit of confusion. This short post was done just for fun try to dispel some of the confusion…while hopefully not misspelling too many terms myself! Should the word pickleball be capitalized? Where does the hyphen (-) come from? When writing the word pickleball, you may occasionally see it written with a dash between “Pickle” and “Ball”. The name of the sport is normally written as one word without a hyphen. The hyphen is used by the company Pickleball Inc. and they have a registered trademark on the name (including the hyphen and capital “P”): Pickle-ball®. As you can see on their website, they use that format everywhere… I understand that if you’ve registered the name you would write it with the (®) when referring to your products but reading their website one day I noticed they also use it to describe the sport in general. Today Pickle-ball® is played all over the world—through community groups, PE classes, YMCA, retirement communities and more. According to a recent article, there are more than 2,000,000 people playing Pickle-ball® in the US alone, and the game is growing exponentially. That just seems a little weird to me, to refer to an entire sport with a registered name…(how about Tennis®, Badminton®, Squash®)? Looks goofy to me but hey, I’m not a trademark lawyer so what do I know? I guess if you go back to 1965, they invented the game and then several years later once it was already a company selling equipment (1972?) and had competitors they decide they need to register the name to protect it. The bottom line on the hyphen: The only place I see the name with a dash is on their website and promotional materials (packaging, etc). Pretty much everyone else refers to the sport as “pickleball”, no dash, no capital letter, no registered trademark. I’m not an English teacher so I’m not the best person to a give grammar lessons but I’m pretty sure you do not capitalize names of sports…football, not Football, except when you are referring to an official name (for example the NFL: National Football League). The same is true for pickleball, it would be capitalized in a name like USA Pickleball Association (USAPA) but otherwise should be written in lowercase letters. Here is an old box of one of the early pickleball sets Hyphen = Yes. Capital P = No. And here is the Pickle-ball® logo…with lowercase P and a dash. Now I’m totally confused. Actually neither! Although some people throw around the terms pickleball racquet and pickleball racket it’s really referred to as a paddle. So where do these “R” terms come from? 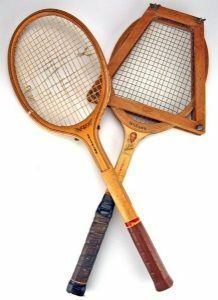 Well, as we’ve said many times, the sport was invented by blending parts of tennis, ping pong and badminton. It’s common knowledge that you use a tennis “racket”…or is it a “racquet”? That depends who you ask…and sometimes where you ask (UK vs the USA). Below is a search showing a comparison of how often the terms tennis racket vs tennis racquet has been used in published books dating back to the 1800s. As the graph shows, the term racket is more commonly used than “racquet”. Actually “racket” pre-dates the French-influenced spelling of “racquet” with the Oxford English Dictionary registering the word “racket” used in reference to sports-as far back as the 1500s. Pickleball partially originated from badminton but the same confusion exists there as it does with other racket/racquet sports….this is a never-ending circle! Is it a racketball racket or a racquetball racquet? Badminton has the same argument. It really depends who you ask -the question of “K” vs “QU” spelling goes back to the tennis discussion above. So we are left with ping pong…that must be where paddle comes from right? “Ping-pong paddle”. That sounds correct. I grew up playing ping pong in the basement with my five brothers. We always referred to it as a paddle and I think everyone does…don’t they? Hold up…I just learned something new today. According to the official rules (“Laws of Table Tennis”), although many people refer to it as a paddle or bat, it is officially called a “Racket”! This has been fun, what started off as kind of a joke about the spelling of the sport turned into an educational experience for me. I hadn’t planned to but ended up spending a couple hours researching the origins of tennis, table tennis and badminton as well as the history of the spelling of the words going back as far as the 16 century. I really was convinced that the word “paddle” in pickleball was adopted from ping pong…and I still think that’s where it came from -even though it’s officially called a “racket”. Just like most people (at least in the US) call table tennis -“ping pong”. Another interesting thing is that as the sport continues to grow and many players are crossing over from tennis to pickleball, we are hearing many new plays still call them rackets. Also, well-known tennis equipment manufacturers such as Head and Wilson now make pickleball paddles and I’ve heard many people using their paddles, and even some salespeople selling them-referring to them as pickleball rackets. After all this, I will continue to spell it “pickleball” (no capital, no hyphen, no registered trademark); and will continue to politely correct people who call it a pickleball racket…or racquet. Speaking of another kind “racket” check out our recent blog post on pickleball noise and the conflict it’s causing between players and local residents in some areas and also how some equipment makers are now starting to manufacture quiet pickleball paddles. Curious about the name? See this: Where did the name pickleball come from? Click here for the answer to many other common questions about pickleball.